A new bridge over the Thames in East London would only benefit ‘former Tory MPs’, a Newham councillor has claimed. Councillor Airdrie Dalden is objecting to plans from Transport for London which include a bridge between the borough and the Royal Borough of Greenwich on the south of the river. Parris was criticised by the Port of London Authority in 2010 after writing about his experience of being swept a mile upriver when swimming across the busy commercial waterway at night. Mayor Boris Johnson claims that the new Thames Gateway Bridge across the river would link the transport poor Thamesmead estate and Woolwich development area in Greenwich with residential and redevelopment areas around Beckton and the Royal Docks in Newham, creating opportunities for one of Britain’s most deprived boroughs. Transport for London are now considering a compromise solution which will involve building half a bridge. At the last Street Talks, a panel presented on the theme of “The quick, the cheap and the temporary: Speeding up the transformation of London’s streets and public spaces”. Hannah Padgett of Sustrans talked about projects that get communities to suggest and try out improvements to their streets and places; Brian Deegan talked about Royal College Street and the research that has gone into Transport for London’s new Cycle Design Standards; and Ben Kennedy from Hackney Council talked about their trial de-motorification of the Narroway. It was all very encouraging to hear how transforming our streets to reduce the blight of traffic and enable walking and cycling doesn’t necessarily have to take decades and hundreds of millions of pounds, and so I look forward to Boris and the boroughs making some rapid progress rolling out this kind of flexible “segregation lite” around the city. It’s good to have it spelled out and spread far and wide: budget cuts are not an excuse. There are two elements to this scheme: the long straight link, and the crossroads node. 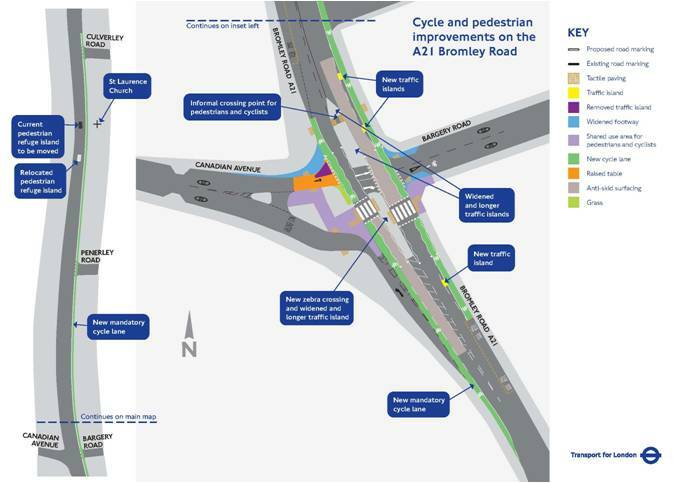 A mandatory cycle lane is proposed for the link — dedicated space found for cycling within the existing carriageway, but protected only by a stripe of white paint. This cycle lane looks like exactly the sort of place that Royal College Street-style segregation could be quickly and cheaply implemented. It would be far from perfect — minimal separation from passing trucks, and only on one side of the road — but it would at least be a quick and cheap interim solution that could be in place on the street within days of a consultation ending. The junction is the problem. Perhaps I just lack the imagination but I can’t picture any amount of the quick and the cheap segregation-lite making a safe, inviting and effective crossroads — especially one in which cyclists have to get past a long dedicated left-turn lane. And fixing the junction is the main issue, since it is junctions that are the least safe and least inviting part of our streets. 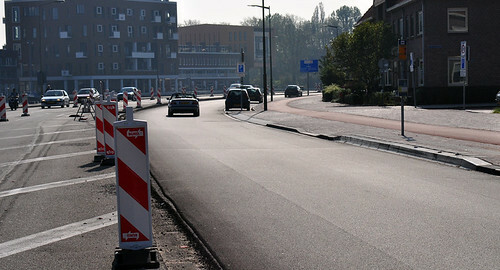 The best way to solve crossroads — and perhaps the only proven way, since Danish and German junctions don’t have such a great record for cycling safety and convenience — is the Dutch way: providing good, direct, high-capacity dedicated space with plenty of separation — in space and, where there are signals, in time — from the jostling and turning motor traffic. And that can not be done with a wheelbarrow load of armadillos. The fact is, the carriageway on the A21 is in the wrong place. It’s the wrong shape and size. Fixing it, to make it the right shape and size, will require at least digging up the road to move the kerbs, but probably also moving some of the things on the street (like lamp posts) and under it (like rainwater drains). That’s not cheap and easy (well, not compared to Royal College Street; it’s still a bargain beside the M74), which is why in TfL’s plans, there is only some minor tinkering with the kerbs to tighten up the turnings in a couple of places, while absurd abominations like that left-turn lane are untouched. Timid, half-hearted improvements are out – we will do things at least adequately, or not at all. 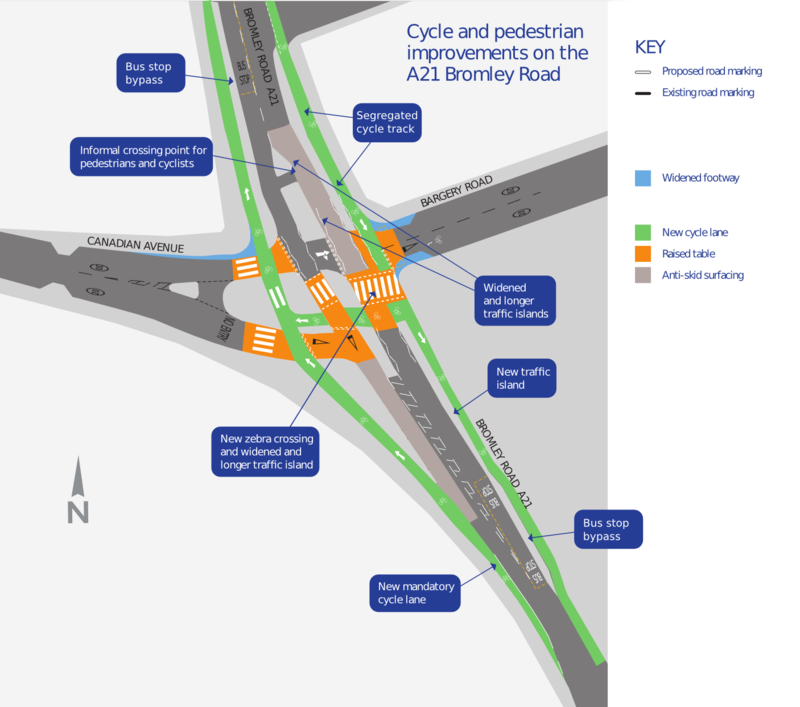 The current plan out for consultation is inadequate; to do things at least adequately here would require the mayor to spend some money correcting the carriageway. The Dutch had carriageways that were the wrong shape and size too, but they’ve slowly worked their way through them correcting that, adding their cycle tracks as they go. 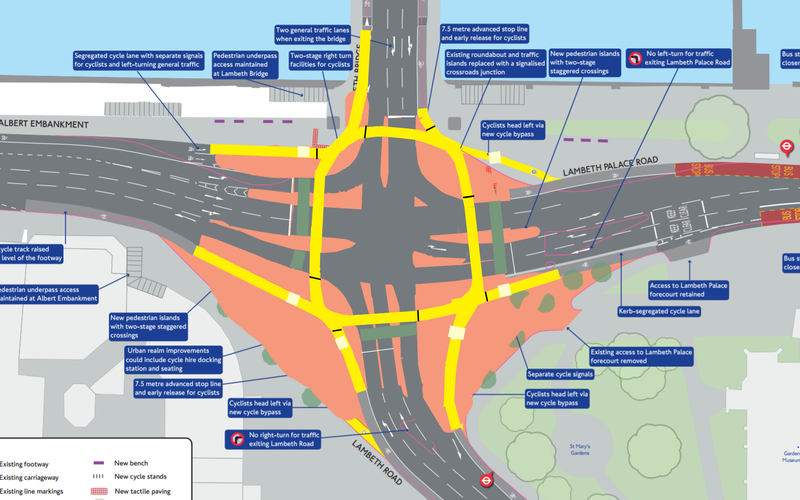 This junction is far from alone amongst London’s main roads — the ones which require dedicated space for cycling — in being a place where I can’t see how the quick and easy could work, and it’s not just junctions where this is a problem. A great many of our streets seem to have been assembled quite clumsily, with carriageway and lane widths bouncing around erratically according to the space available between buildings, obstructions strewn across footways without thought, and decades of added and moved and sometimes removed buildouts and islands, stacking lanes, bus stops and loading bays. They’re a mess, and trying to retrofit them for cycling could only make them an even bigger mess. To do things adequately, you’re often going to have to sweep away the accumulated mess, cast off the constraints of the motor-centric streets we’ve inherited, and do things properly. But we managed to put the money and effort in to install all of those ill-conceived left-hook lanes and junction stacks in the past. We should be able to find the same to now fix those mistakes.